Our Condor flight to Vancouver left Frankfurt at 1.40 pm. I am not a big Condor fan due to their seat spacing, which I find a little tight for my 6’10. But for this trip, their connection Frankfurt/Vancouver and direct return Anchorage/Frankfurt was ideal for us. For more legroom I had changed our original booking from economy to Premium Economy. It was very pleasant to have hardly any people in line at the Condor Premium Economy/Comfort Class counter. The exchange with the lady behind the desk started off very friendly, too. Until she began weighing our carry on luggage. It was 1 kg and 1.5 kg respectively above the 6 kg limit. The lady lost her smile and made it very clear that we had a problem. To cut a long story short: After I removed my IPad from my rucksack to declare my camera bag a notebook, and after removing jackets and hiking boots from our bags and putting them on, we were fine. On the inside I was fuming - as if the IPad or our boots would fly on a different plane - but on the outside I remained friendly and reminded myself that we were on vacation. Once in the boarding area at the gate, I was surprised to hear my name being called to the desk. The person at the desk asked me for my boarding pass and whether I was travelling alone. I wasn’t, so I also got Birgit’s boarding pass. A few minutes later, a Condor staff returned, handed me two new boarding passes and with an apologetic smile explained that they had to move us a few rows to the front. One look at the boarding pass told me that we had been upgraded to Comfort (Business) Class! And this is how quickly I was reconciled with Condor! The seats were very spacious and could be reclined to almost horizontal position. Even before take-off, Birgit was offered a glass of champagne by the friendly staff. Very nice! We are lucky travelers! 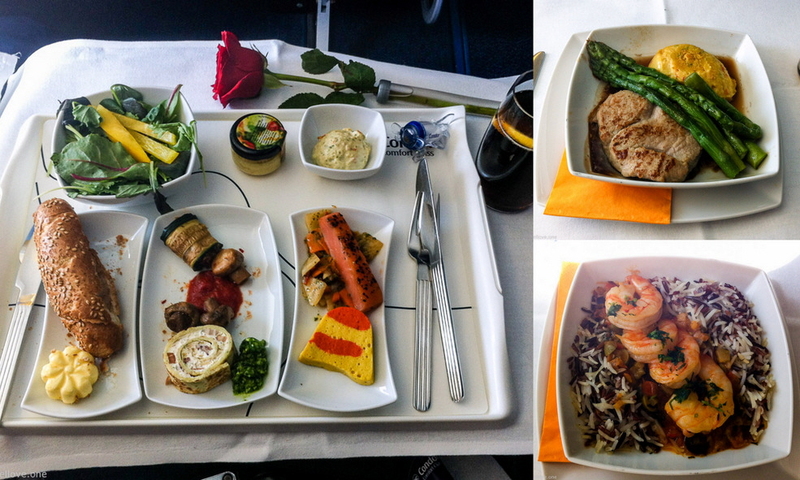 The food, served soon after take-off, was far superior to that in economy. First they laid the table – including a red rose on a white table cloth – and served a starter platter followed by a main course. With a long film on my IPad, the flight to Seattle, our stopover, went by quickly. Immigration and the mandatory passage through US customs including picking up and re-checking of our luggage went swiftly. 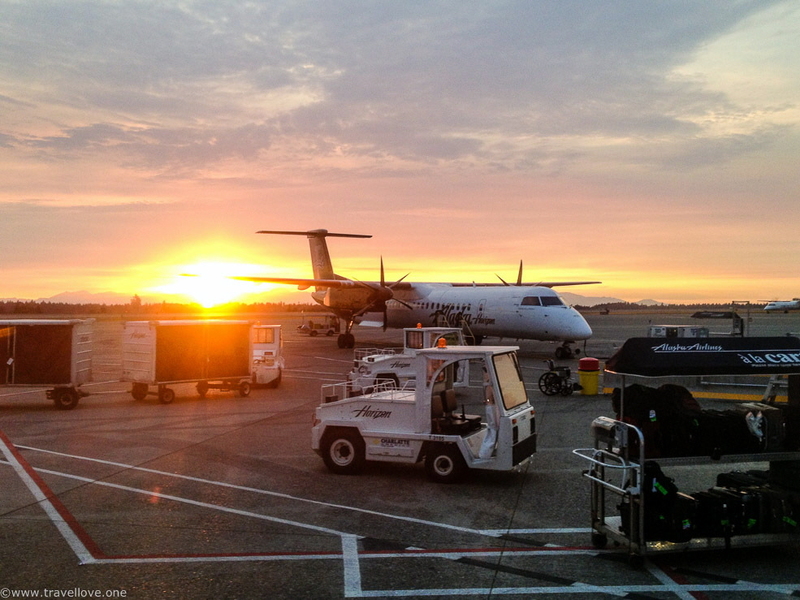 Unfortunately, we had already been informed beforehand that our connecting flight had been postponed by an hour, so we had to wait a total of 4 hours before we could board the smaller Alaska Air turboprop aircraft for the remaining 40-mintue flight to Vancouver. The duration of that flight was disproportionate considering the layover, but it was very pleasant with a beautiful evening light. 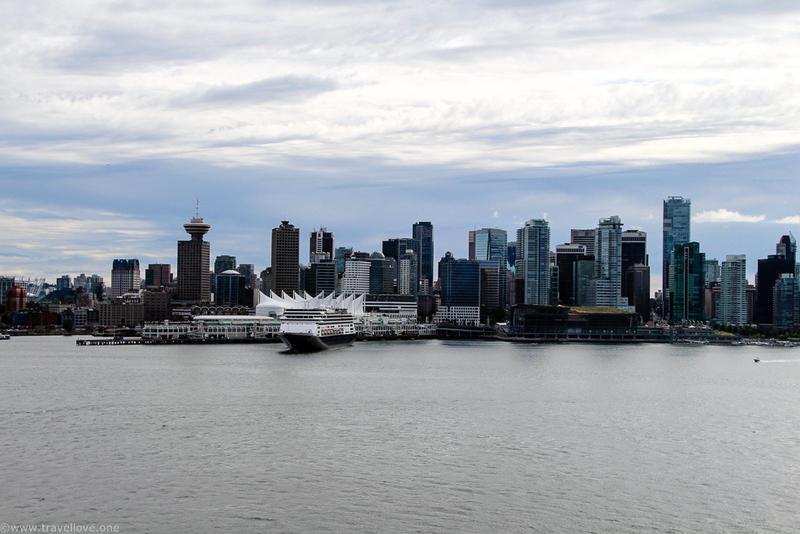 It was almost 9.00 pm local time when we arrived in Vancouver. 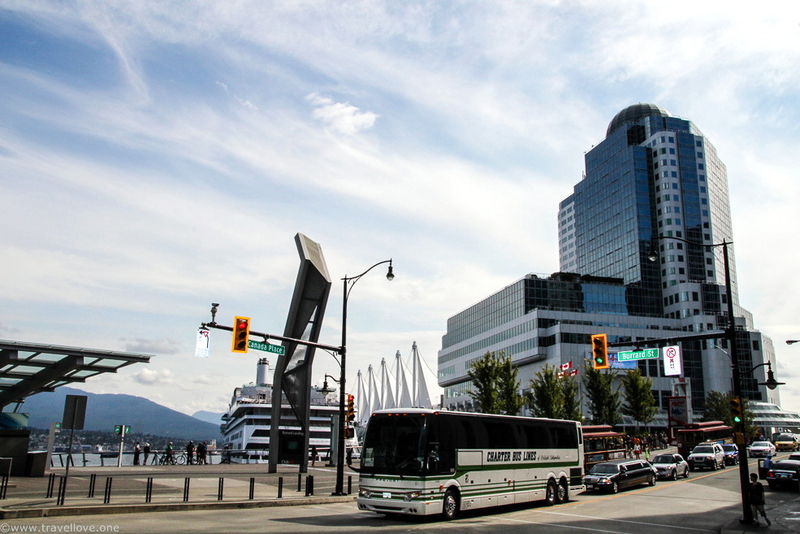 We went through Canadian immigration and took a taxi to our hotel. There is also a very good sky train connection into town, but all we wanted was to get to the hotel and go to bed. 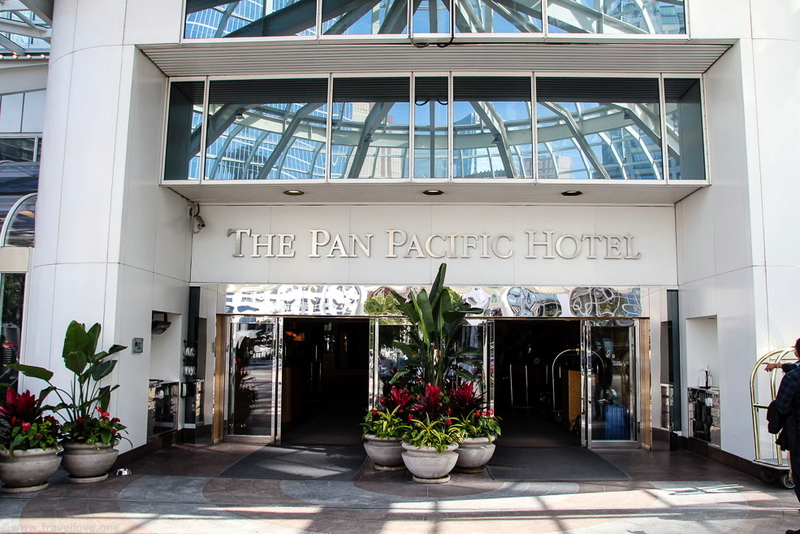 When we checked in at the “Pan Pacific”, the lady at reception told us that they had upgraded us to a higher room category free of charge. Honestly, after a 24-hour trip, the following view was heaven for us, regardless of the room category. 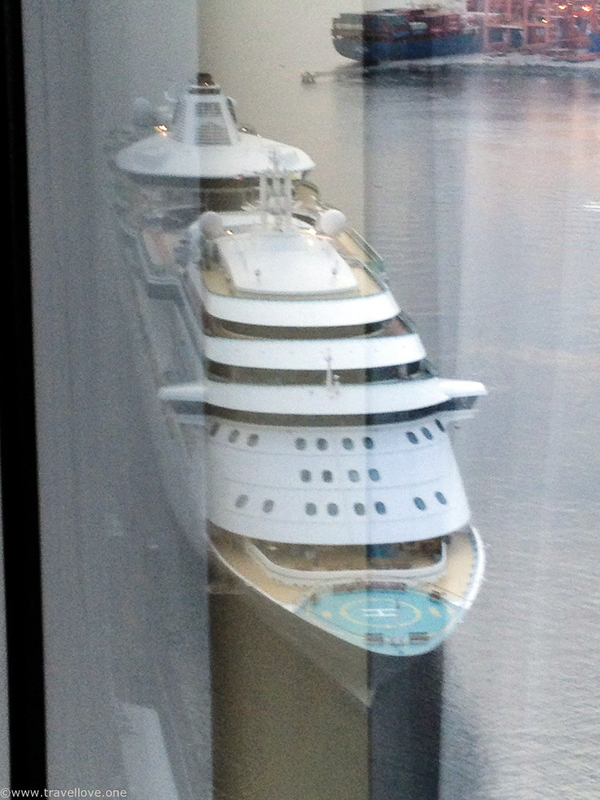 Waking up from our well-deserved sleep, we saw the Radiance turn around the corner and dock right below our window. That’s when we knew we were on vacation! 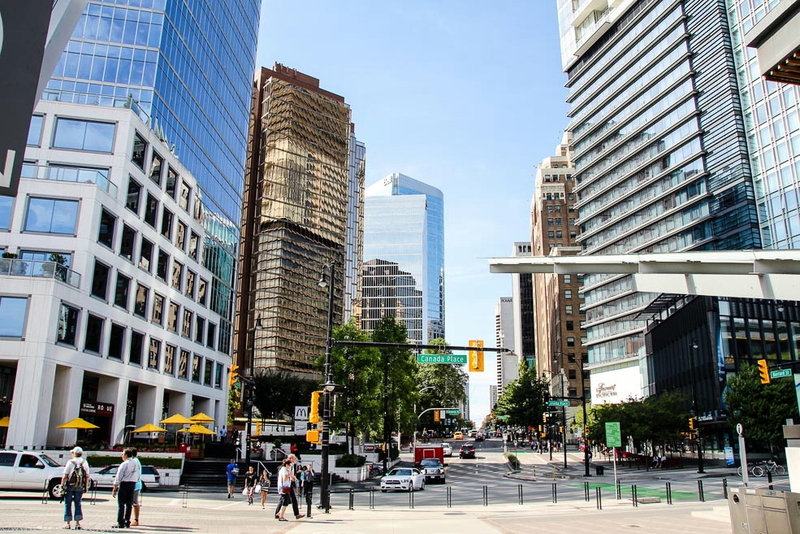 During the planning phase of this trip we thought we’d spend a little more time in Vancouver, which is why we booked the comfortable but also pricy Pan Pacific Hotel. 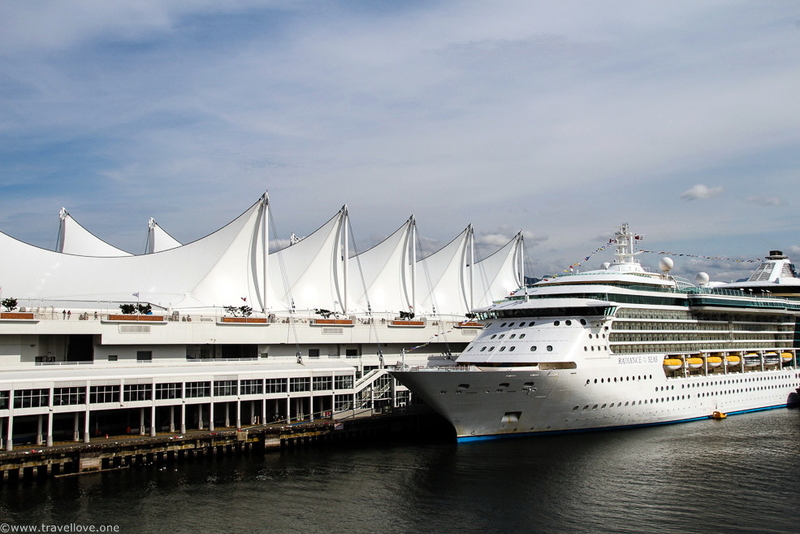 The hotel is the largest part of the Canada Place building complex and at the same time the cruise ship terminal. 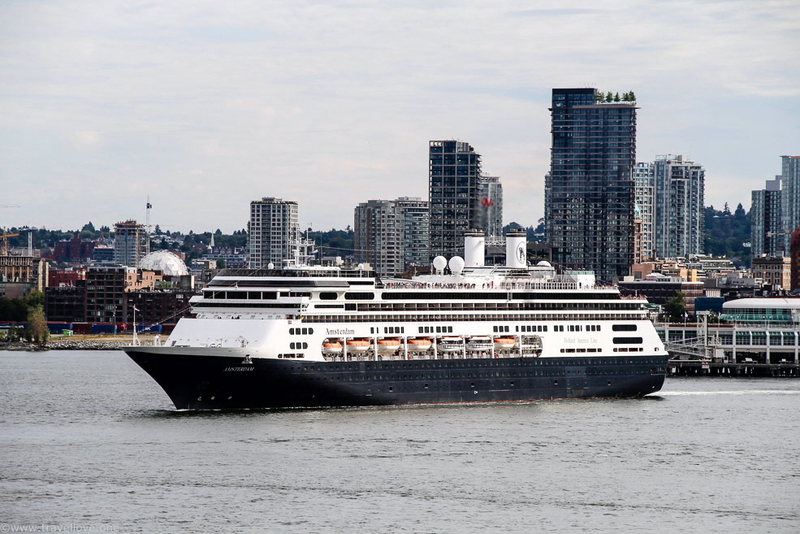 We had booked a package for cruise passengers, which included room, Wifi, breakfast and late checkout until 2.00 pm. Before venturing off on a little discovery tour of our Vancouver neighborhood, we indulged in an excellent breakfast from the vast buffet. 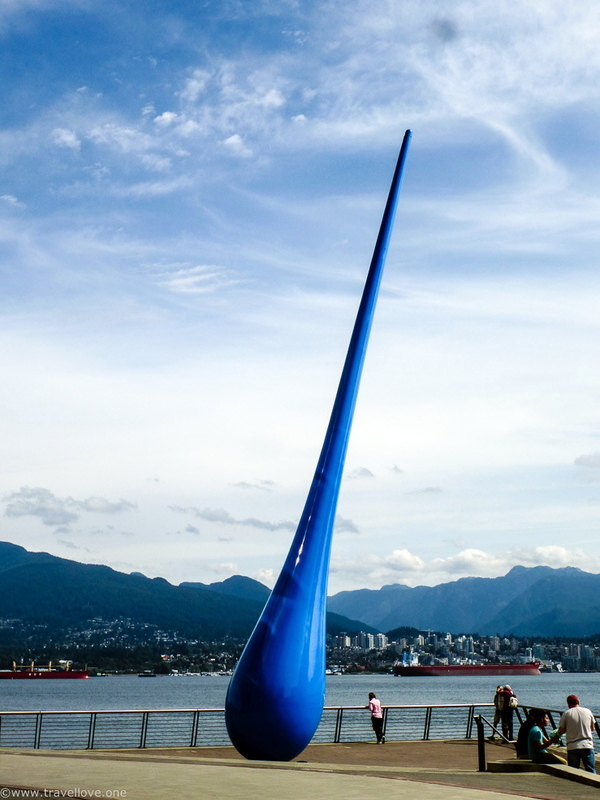 From here we could already see the ships at the pier: the Radiance on one side and the HAL Amsterdam on the other. 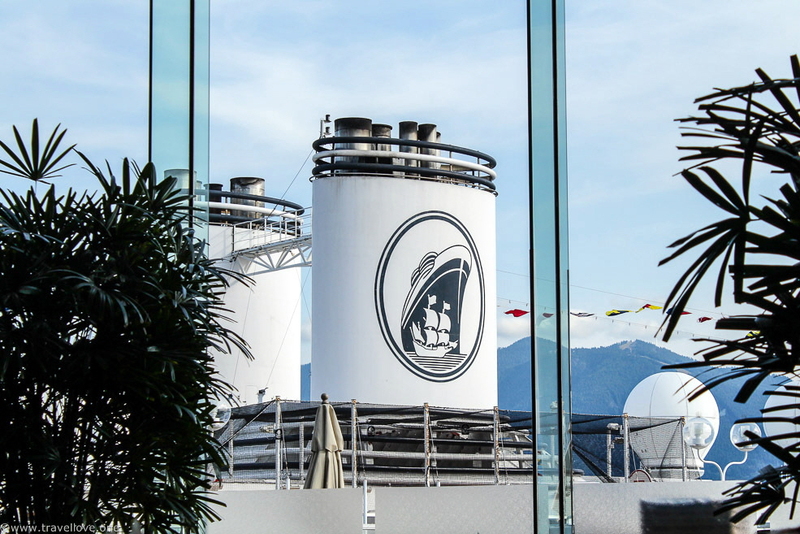 It was no surprise that many travel stories could already be heard from cruise passengers at the tables around us. 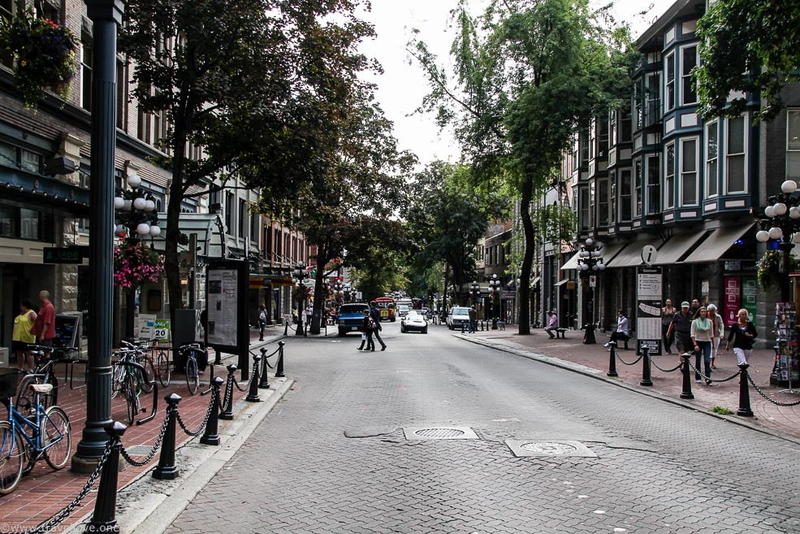 After breakfast we walked only a few blocks to Gastown, Vancouver’s oldest district. 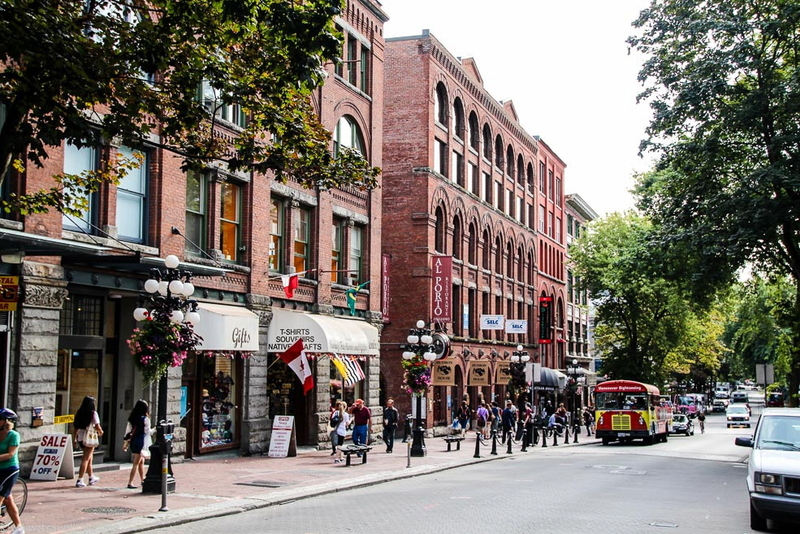 It almost completely fell victim to the “Great Vancouver Fire” in 1867, after which it was entirely rebuilt from scratch. 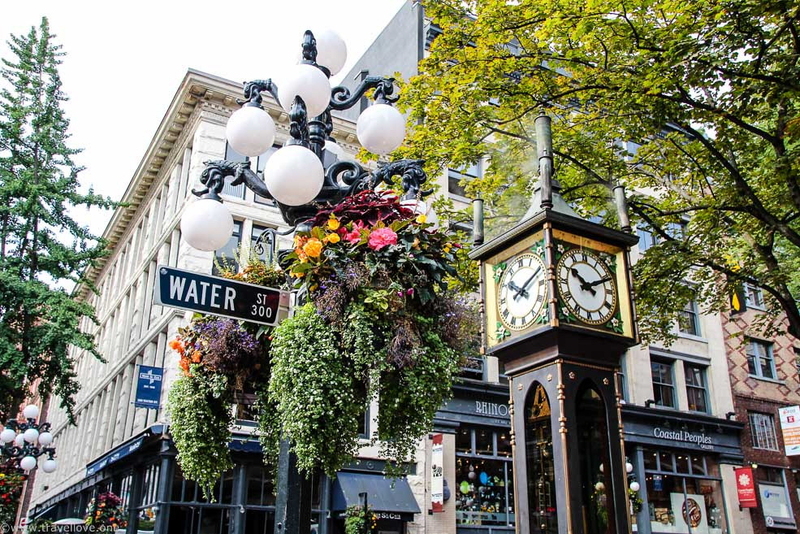 These days, it exudes a very charming flair with its cobbled streets, restaurants and small boutiques. 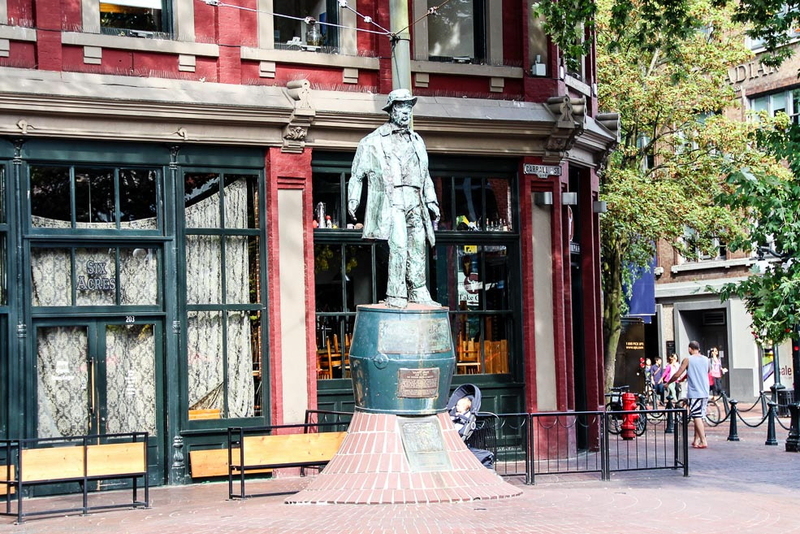 One of Gastown’s most significant landmarks is the statue of ”Gassy” Jack Deighton, who opened the first saloon here in 1867 and thereby gave both the district and the Gastown Steam Clock their names. 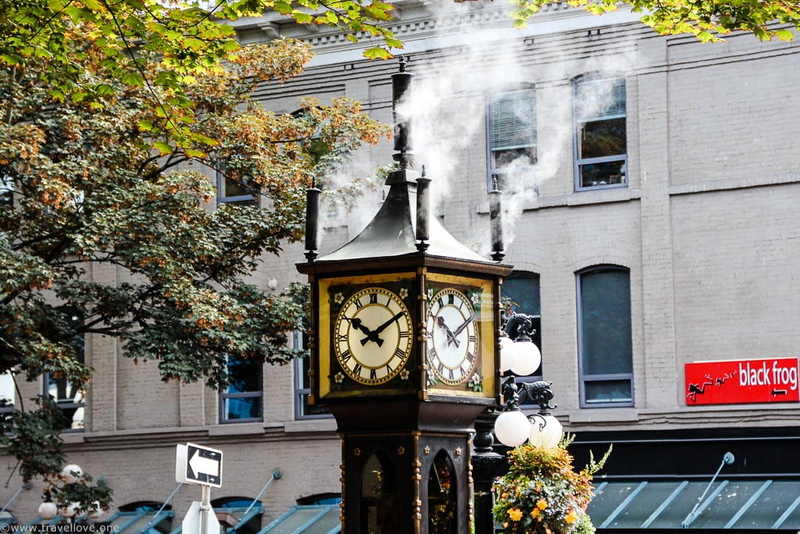 The steam clock is powered by a small steam engine inside, which in turn uses the city’s district heating system as its source of energy. 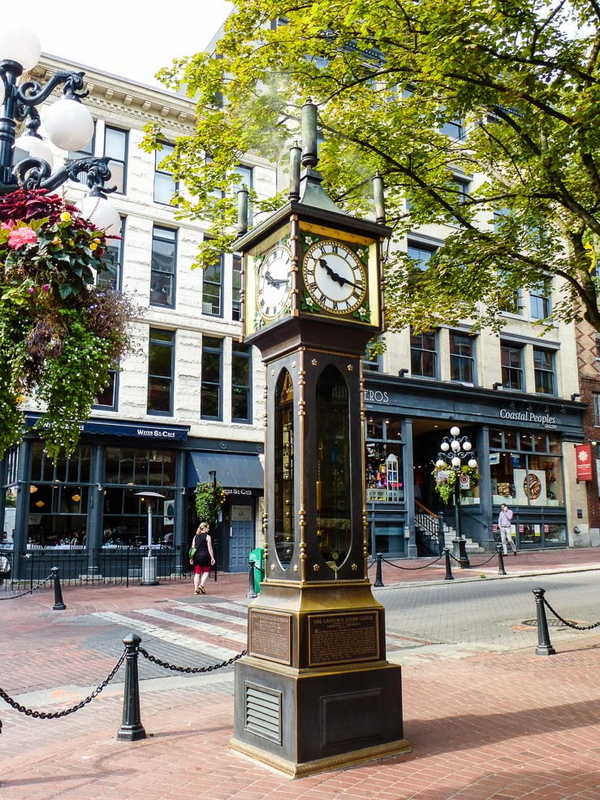 Instead of a carillon, this clock marks the full hour with an organ of steam whistles. 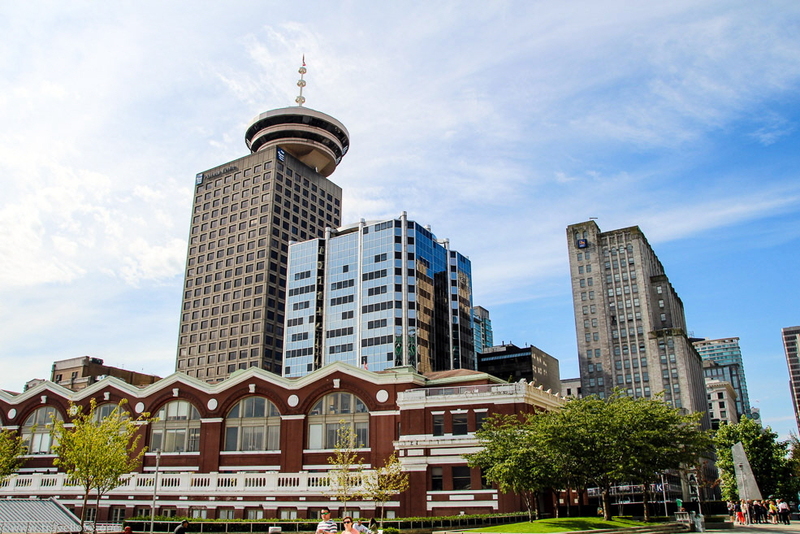 We returned towards Canada Place past the Vancouver Lookout, one of Vancouver’s most famous buildings overlooking the Waterfront Station. 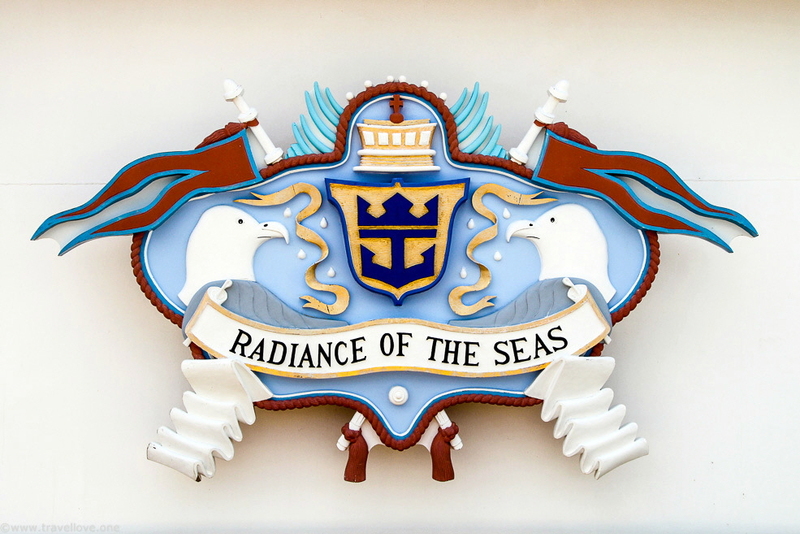 On our way, we kept catching glimpses of the Radiance. 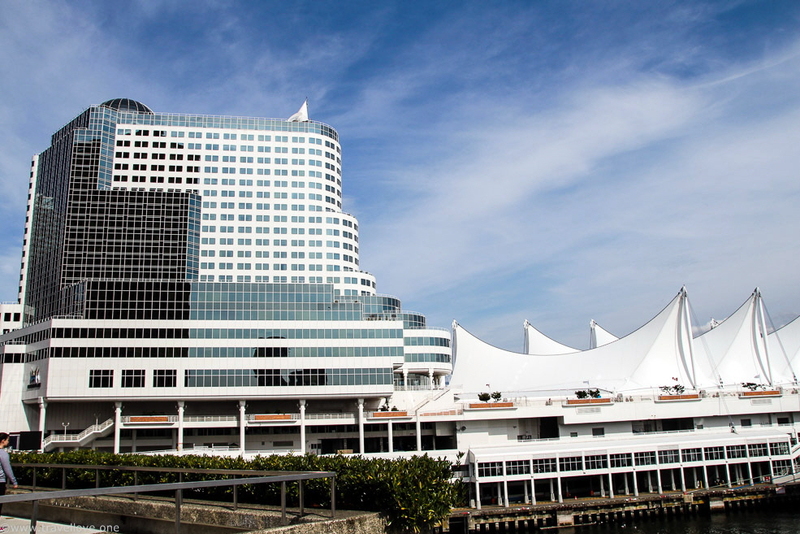 Besides the Pan Pacific Hotel and the cruise port terminal, the building complex of Canada Place also hosts Vancouver’s Exhibition and Congress Center, an IMAX cinema and a shopping mall. 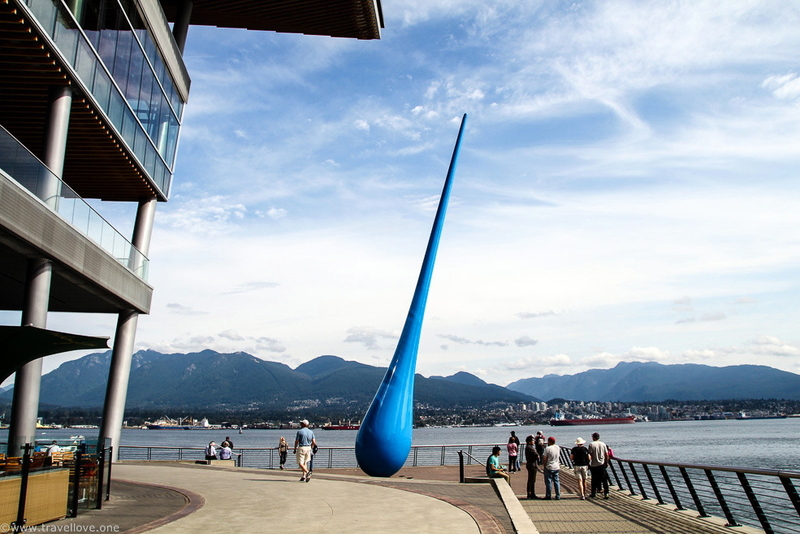 In front of the exhibition building, „The Drop“, the beautiful sculpture shaped like a giant raindrop, pays tribute to the force of nature. 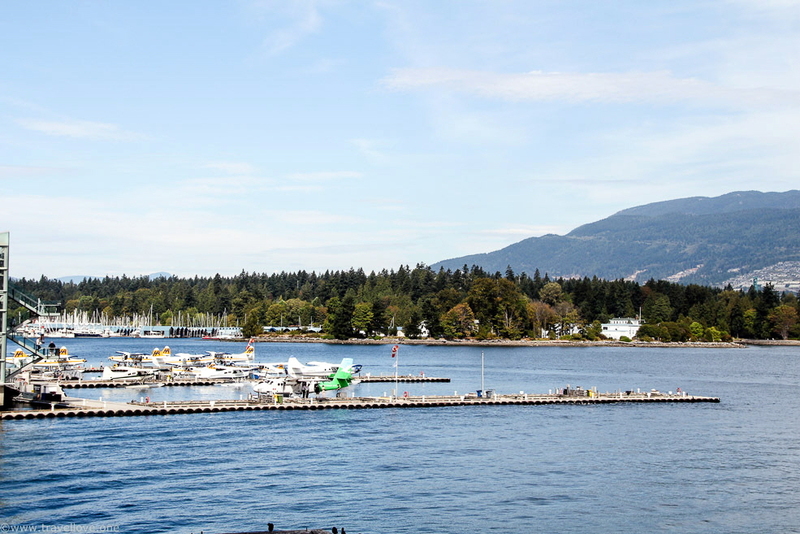 The promenade near the exhibition center offers great views of Vancouver’s floatplane airport, from where floatplanes seemed to leave every second. To me, this sight inspired a certain air of adventure. Slowly but surely we were no longer able to resist the call of our ship, so we returned to our room and packed our bags. 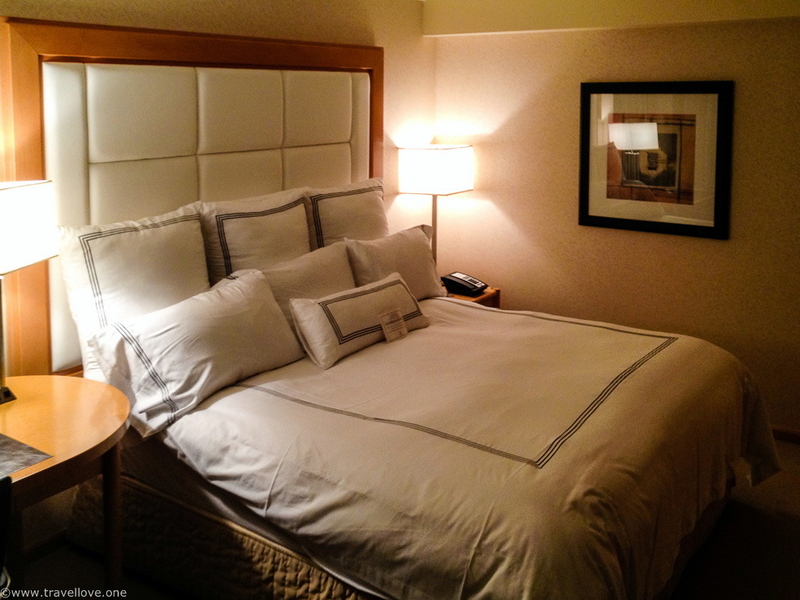 The hotel offers a special service to cruise passengers: We only had to call front desk and ask for our suitcases to be picked up, which were then directly checked in by hotel staff. All we had to do was take the lift to “Cruise Ship Level” and proceed directly to the Royal Caribbean check-in. Prior to boarding, we had to pass through US immigration, as access to the ship is considered an entry to the United States. 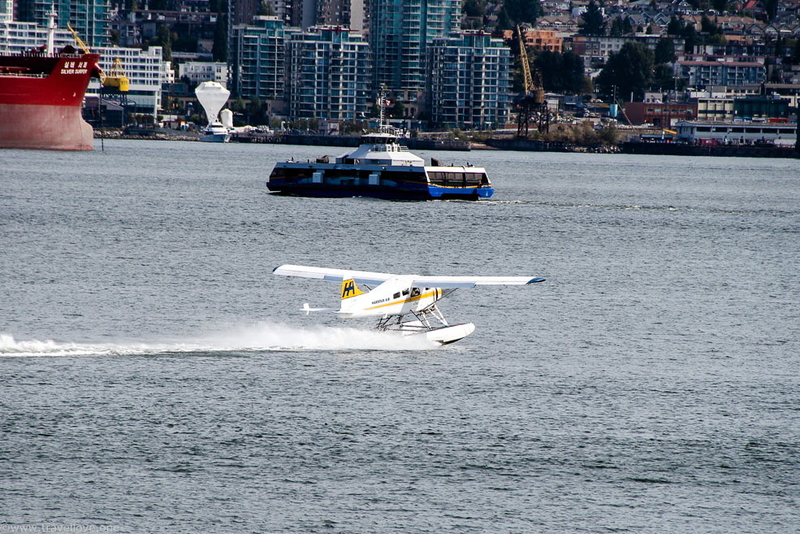 Check-in itself was quick and swift, and with a smile and a friendly “Welcome back” we were given our sea passes. My heart jumped with joy: back on a ship at last! 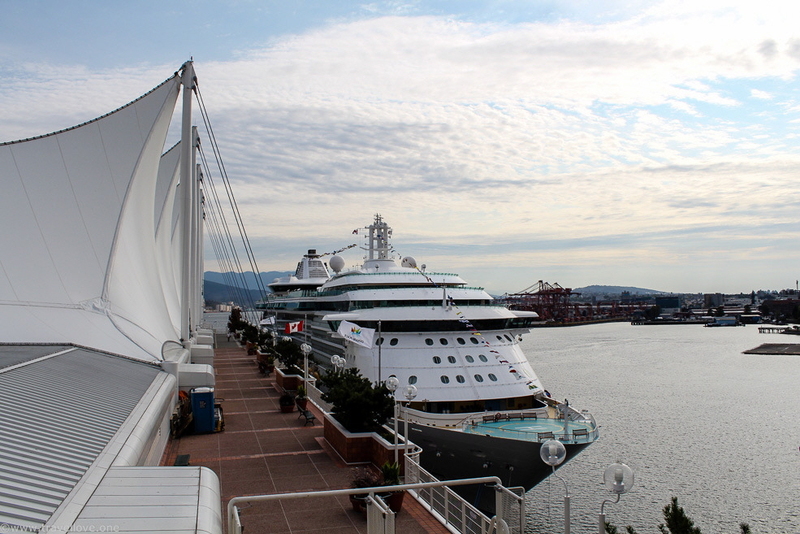 We sailed away on time, and shortly after us the HAL Amsterdam followed suit. 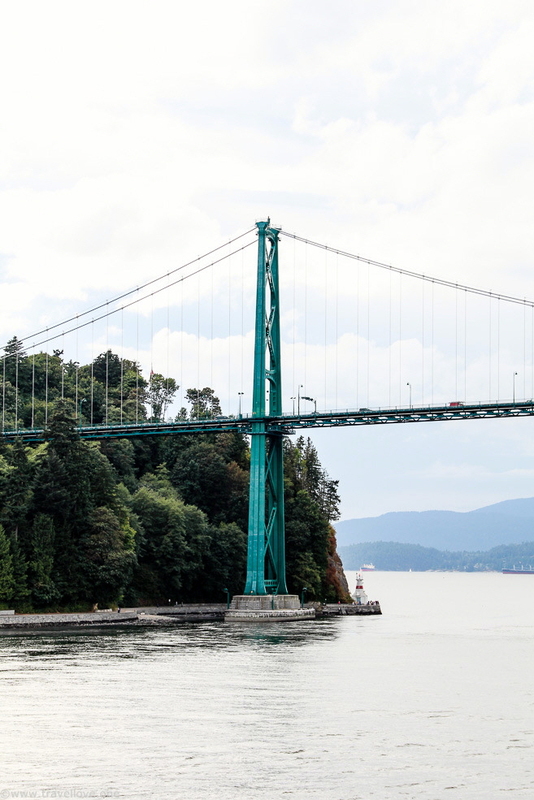 Passing beneath the "Lions Gate Bridge" we left Vancouver.